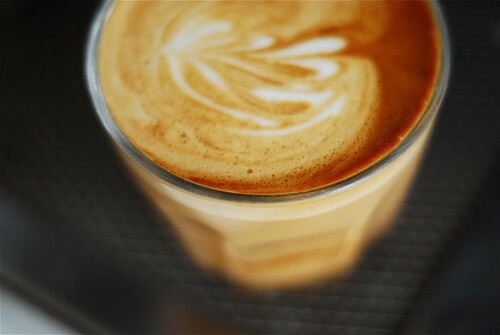 They are only 1 year old but their popularity is growing, Espresso Lab that is, situated in Woodstock, Cape Town. If you’ve been reading my blog, you’ll know that I discovered way back in October 2009 – well, they were 5 months old. OK ! So it’s one of my prime stops for coffee in Cape Town and lucky for me, my familiarity with Renato, the roaster, has helped increase my coffee knowledge. Usually sourced from high quality coffee farms when in season, Renato prefers to roast in a manner that brings out the fruity and spicy elements in a coffee, almost like coffee for the sophisticated, so if brewed correctly, you should get soft chocolate, apricots, lime, honey and caramel notes. In this manner and I may be generalizing, the coffee is roasted lighter than most. To compliment this style of roasting, you also need to set your brew temperature (if you’ve got one) to between 91-93 C. Lucky for us, Renato places a variety of information on each coffee bag, ranging from roast date, blend composition, tasting notes and brew parametres. 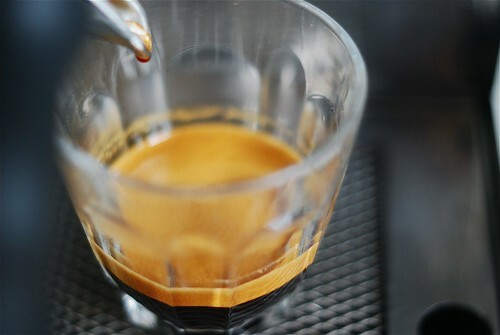 Just a note; as I don’t have a brew temperature control, I usually run the machine for a few seconds to cool it down a bit, before I extract my espresso shot. OK ! So what have I been having. Lots and the main ones I can remember are Panama Mama Cata, Organic Espresso (Brazil and Ethiopia), Espresso 004 Version (panama mama cata, costa rica puente tarrazu and ethiopia hama) and just finished Espresso blend 008 version (brazil serra do bone, costa rican puente ecologico tarrazu and ethiopian guji). I should mention that Renato likes African coffees too. So first up,the Panamanian coffees, santa teresa and mama cata, which I will never forget, tend to have very distinctive tastes, such as lime, grapefruit and chocolate, wow ! I recall tasting them at espresso lab when they were having an in-house tasting session and the mama cata was really different. Look at that golden trickle, like honey. 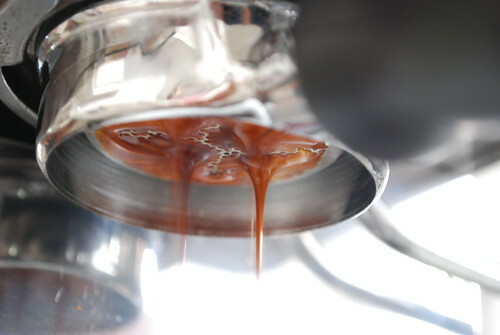 Second up and very in-tune with espressolab coffees are the high notes of fruit, complimented with soft cocoa tones and a hint of honey and sometimes caramel, encapsulated in the ESP004 blend, which featured a 40% composition of mama cata. Nice – was my first impression. However, as I’ve lost some of my pics due to my hard drive crashing a few weeks ago, I can’t share a pic with you, unless the pics are retrieved. Wish me luck. I looked forward to the mornings, as when blended with milk, the chocolate and caramel tones pulled through the milk for quite a pleasant brew. As the first people that served me a cortado, I usually made a cortado to compliment this delicious espresso blend from espressolab, which I think is their best to date, well done espressolab. I hope Renato doesn’t tamper with this blend for a while as I know he prefers to source seasonal coffees and I’ve got an exciting package of more coffee to taste coming soon to share with you. If you can, grab a bag quick, when you are near Woodstock or visiting the Old Biscuit Mill on Saturday morning, Ciao ! 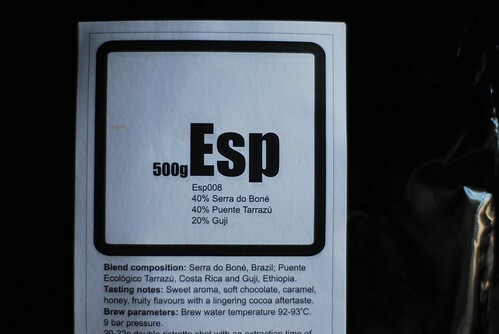 This entry was posted on Monday, May 31st, 2010 at 11:40 pm	and tagged with arabica coffee, Cape Town, espresso, espressolab and posted in Bean Talk - Coffees, Coffee Roasters, I'm Drinking. You can follow any responses to this entry through the RSS 2.0 feed. I have to say, every time I come to fromcoffeewithlove.com there is another fascinating article up to read. One of my friends was talking to me about this topic several weeks ago, so I think I will send my friend the link here and see what they say.